The America’s Transportation Awards competition began in 2008. 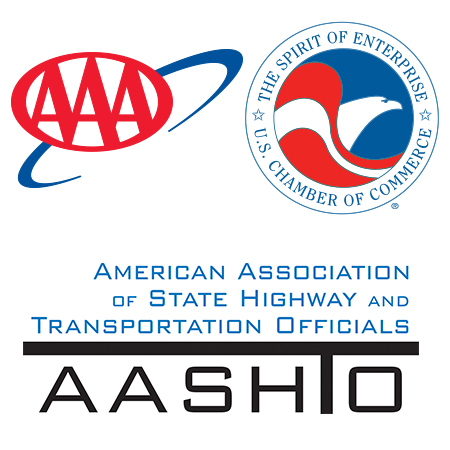 Through a partnership between sponsors AASHTO, AAA, and the U.S. Chamber of Commerce, the competition serves as a way to recognize state DOTs and highlight the impactful projects they delivered to make their communities a better place to live, work, and play. Now in its 12th year, the America’s Transportation Awards helps to showcase why transportation infrastructure–and why properly funding it–is so vital. Share your state’s stories and nominate your projects (up to three!) in the 2019 competition. Projects in the Operations Excellence category demonstrate the ability to make more effective use of existing transportation assets in order to reduce congestion, improve reliability, address maintenance, or advance transportation systems management and operations efforts. This category recognizes those projects that delivered a more reliable, well-functioning, and/or safer transportation system through operational solutions. The Best Use of Technology & Innovation category recognizes new technology and/or creative and innovative solutions implemented by a state department of transportation as part of a transportation project. Nominees should focus on how the new technology or innovative solution was able to help the project in a way no other solutions could (for example, did it save time, money or help the community? Did it help the DOT tackle other hurtles?). These innovative projects provide a better solution to connect their communities to businesses, jobs, health care facilities, and recreational activities while encouraging a mix of transportation modes. Priority is given to projects that enhance and support transit and non-motorized transportation. Project nominees should demonstrate community involvement and interaction, and must illustrate the public benefit for customers/users (e.g. – safety, economic development, improved mobility, access to public lands/open spaces). All nominated projects will first compete on a regional level against projects of their own size–Small (projects costing less than $25 million), Medium (projects between $25 million and $199 million) or Large (projects $200 million or more). After all regional meetings have taken place over the summer, the three highest scoring projects from each region will be named the “Top 12” and will go on to compete for the top two national prizes. The Grand Prize is selected by a panel of judges, while the People’s Choice Award is decided by online popular vote (as with the previous year, votes will be scaled to state populations to determine the winner and allow smaller states to compete more fairly). Winners of those top two prizes will each receive $10,000 to donate to a charity or scholarship of their choice. Projects must have been completed between Jan. 1 and Dec. 31 of 2018. Only state DOTs are eligible for the competition. Ready to nominate? Click here to fill out the nomination form. Have questions? Contact Kaitlyn Meuser, AASHTO marketing specialist, at 202-624-5470 or by email at kmeuser AT aashto.org or Maggie Kasperski, AASHTO communications and marketing manager, at 202-624-3659 or by email at mkasperski AT aashto.org.